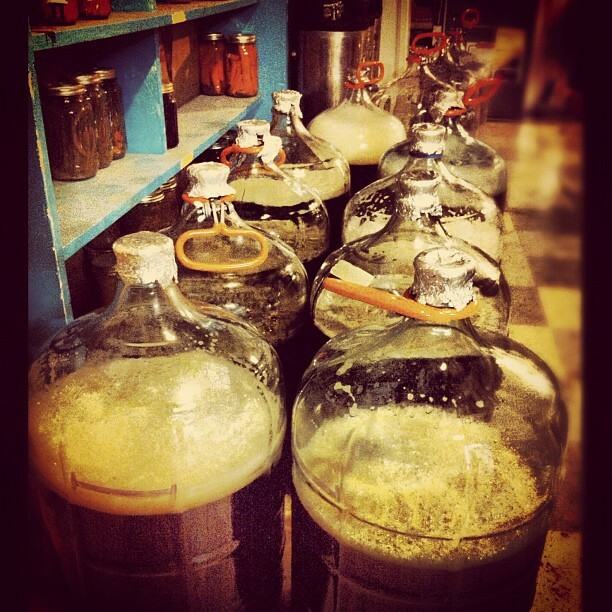 Anyone want to join in on a brew project? My good friend Jamie picked up a full size Bourbon barrel. Now the plan is to fill it with Old Rasputin Russian Imperial Ale (clone) and let it oak age for a year. If you haven’t tried Rasputin, you really should – it’s a smooth, delicious 9 – 10% ABV. However, it’s going to be expensive to brew. Over 225 lbs of grain and 50 oz of hops. So, we had to search out a few “investors” who could front some funds to get the project rolling. Normally, Old Rasputin runs $22 for each 500ml bottle. At full price, that would be over $800 for just 5 gallons. 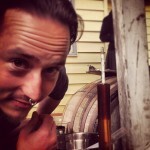 Technically, a Burbon barrel holds 53 gallons. 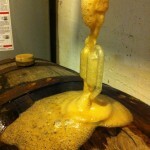 However, after a year, there could be a bit of sediment in those last few gallons. Always nice to have a little room for error. This will be the 3rd life for this particular barrel. 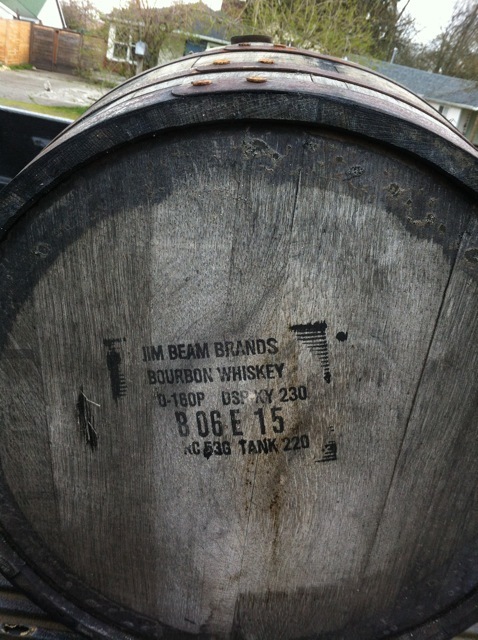 It started out as a barrel to age Jim Beam Bourbon. Then it was brought to our neighborhood to age a beer for Widmer Brewing. 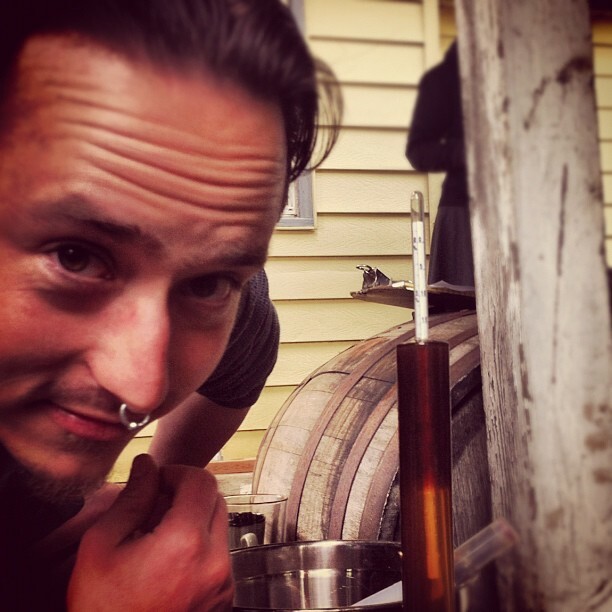 When Jamie picked up the barrel, we feared the it’s flavor might have been spent, but – after removing the bung – a quick sniff revealed a clean, Bourbon scent. 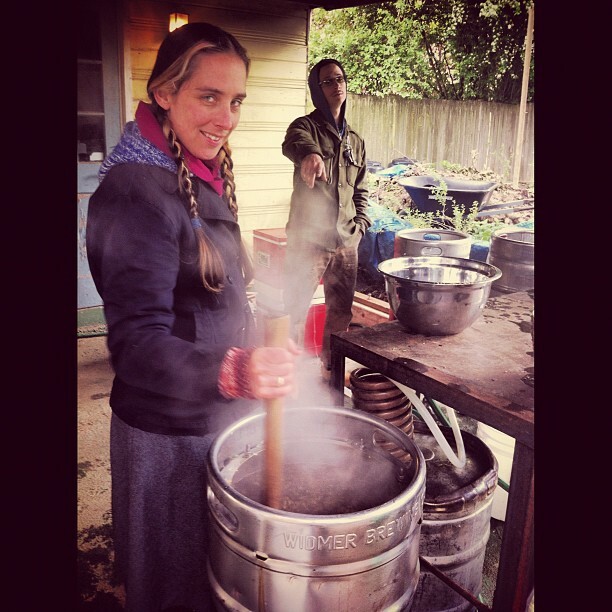 After a week, we emptied the barrel and rinsed it with cold water several times. 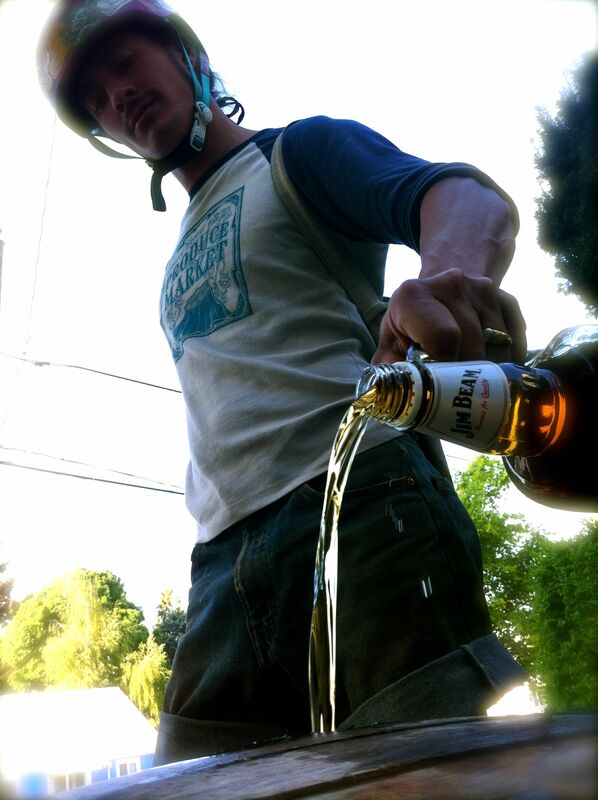 A half gallon of Jim Beam was then added to “recondition” the barrel. Each day, we rotated the barrel a bit to make sure that the Bourbon contacted all of the surfaces. This is for a big Russian imperial based on the highly regarded Old Rasputin Clone. 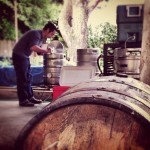 We plan is to brew 5 x 12 gallon batches to fill up a full size oak Burbon barrel and let it age for up to a year! Size: The recipe was scaled from 5 to 12 gallons. Scaling recipes is not always a linear adjustment, so I modified it accordingly. Right now the efficiency is set at 70%. After the first batch, I may modify the grain bill to ensure that the barrel starts at 1.091. Yeast: Plan to use Pacman vs. WLP 001. I always have good luck with this this strain and will have a huge cake ready from a previous 24 gallon batch. It is very similar to 001, even perhaps a bit cleaner. 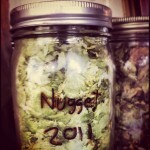 Hops: Since were going huge, I want to use hops that are readily available. The beer is dark and will be aged, so substituting hops should be fine. For the bittering we will use nugget vs. cluster. The two northern brewer additions will be played by Willamette. Update: 4/25: I received some good feedback about the substitutions. The best sub for Cluster is actually the Australian hop Pride of Ringwood (which I have access to). 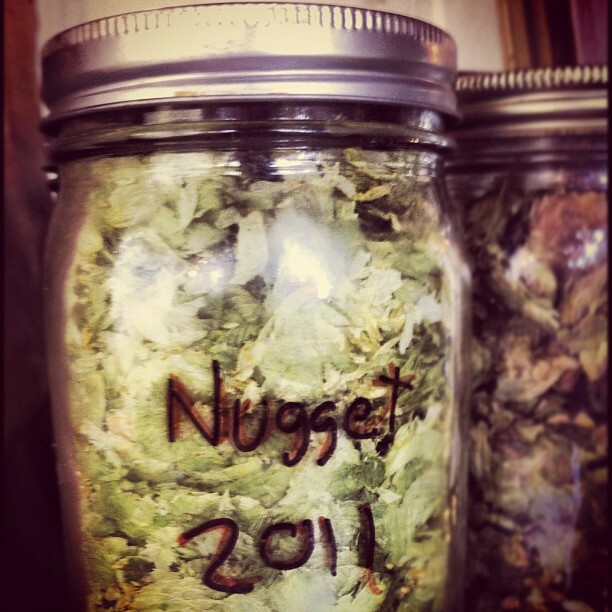 Northern Brewer has a spice that Willamette won’t replicate – better options include Nugget and Chinook. The centennial will, of course, stay the same. 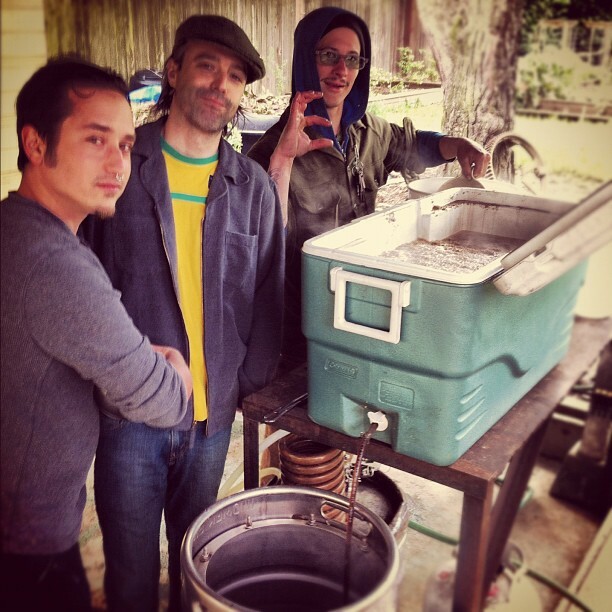 This was one epic brew session. 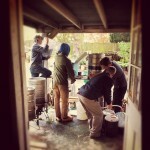 We had enough equipment on hand, so the decision was made to brew all 60 gallons in one day. Coincidentally, May 5th happened to be the 2012 national Big Brew Day. I had created a schedule starting at 6am. Unfortunatly, I was up until 4am the night before cleaning all the carboys, so this didn’t go to plan. Instead, we got the water started at about 10am when people began showing up. A big thank you to everyone who showed up. Throughout the day, many people stopped by to help. This was important since we had multiple batches going at once. 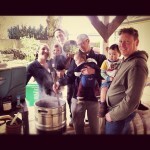 Several of you stayed for the 8+ hours and even ran errands – for instance, when we ran out of propane (twice). You all rock! 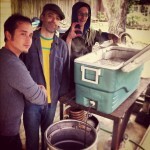 The biggest change for this brew session was using separate coolers for the Mash/Lauter. This allowed us to brew assembly-line style. One batch would be mashing, another would be sparging, while a third would be boiling. The only issue was keeping track of things and making sure that we had enough people on hand. There were a few hiccups – like a water hose that got too close to a burner – but, overall it went well. One big advantage of the multiple batches was water conservation. Normally, you waste a lot of water cooling down the wort after boiling. 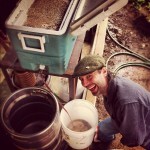 This time, we had the chance to use that water for the next batch. For the final batch, the waste water was transfered to the barrel and mixed with metabisulfite. These great photos are by Phil. Check out the full set. 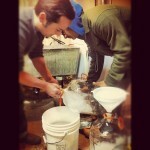 0 hours: The wort was transfered to 15 carboys (4 gallons each) and placed in the basement (about 65 degrees). 2 hours: 500ml of active Pacman yeast slurry was added to each carboy. 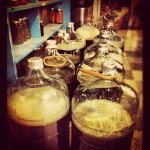 12 hours: Fermentation has begun! 24 hours: Very active fermentation. Already seeing some blow off. 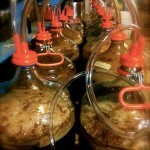 36 hours: the fermentation has already slowed! 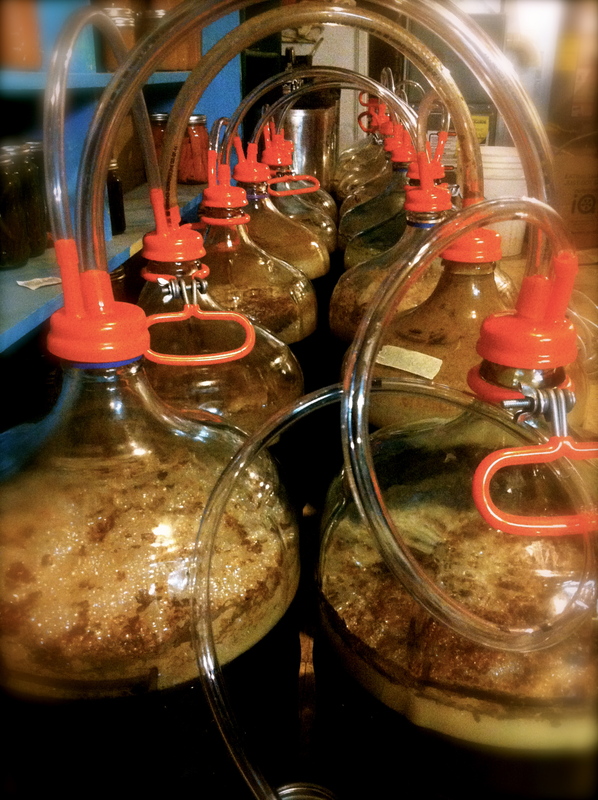 9 days: Fermentation has mostly stopped. 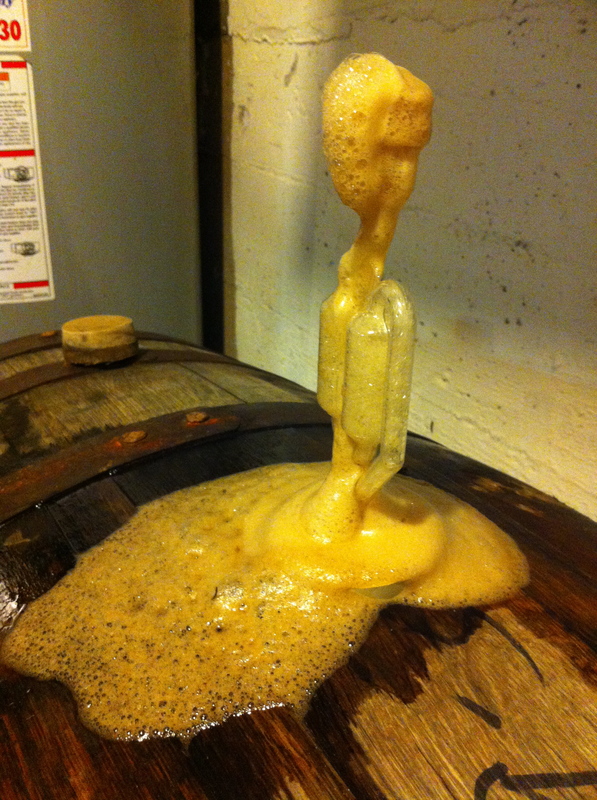 Carboys moved upstairs (70 degrees) to allow the yeast to “clean up” a bit. 10 days: A little increase in bubbling, but not much. 3 weeks: All done. Ready to fill barrel. The hard part was moving the barrel down to the basement. Once there, we shimmed it into position with some cedar blocks. 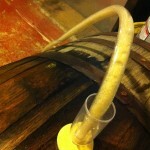 Before filling, we decided to remove the excess Bourbon that was added after washing the barrel. To our surprise, the quart of liquid that came out was more water then alcohol. Evidentially, the Bourbon seeped into the wood replacing some of the liquid that was already there. We then set up a table and started racking the carboys, two at a time. Jamie and Luke handled this part and it seemed to go very well. In no time at all, we had a full 53 gallon barrel. There is even enough left over to top it off over the next few months. I did have to add a blow off tube to contain the massive foam. Topped off the barrel with about 1/2 gallon. Sampled a bit – it is good, but there are only minimal oak notes. I pulled off approximately 1 gallon to force carbonate before topping it off again. Update 9/16 – Had a chance to taste the carbonated beer. Some real vanilla notes are starting to develop. Shared some samples and everyone seemed to agree: It’s getting there, but could use 2-4 more months. This last weekend, Jamie and I had the chance to share another sample from the barrel. We were both impressed. Our Russian Imperial has taken on some wonderful oak and vanilla notes. It is smooth and dark and way more alcoholic than it tastes. 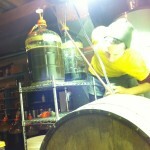 As such, we think that it is nearing the optimal time to pull the beer from the barrel. An event poll has been posted for all the members. Hopefully, we can find a time to get most everyone together to drain this thing in November. 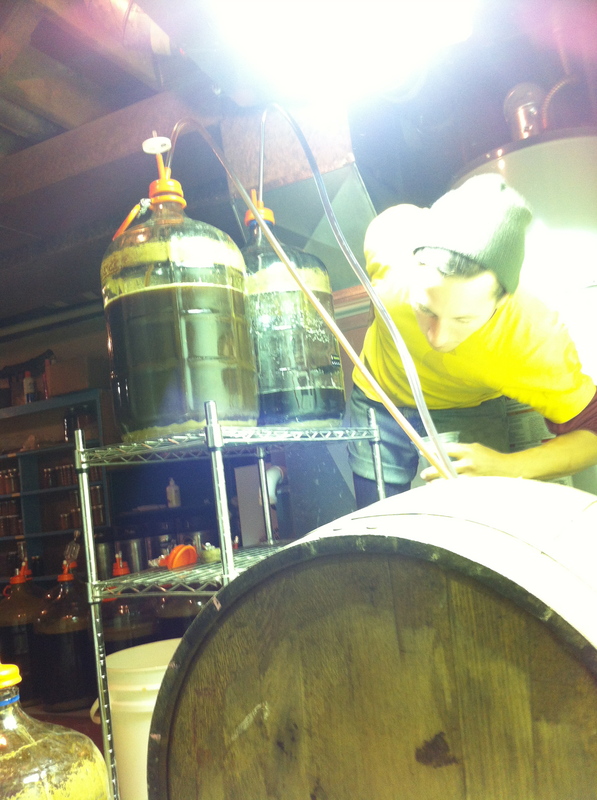 On Sunday, we all got together in my basement to drain the barrel. 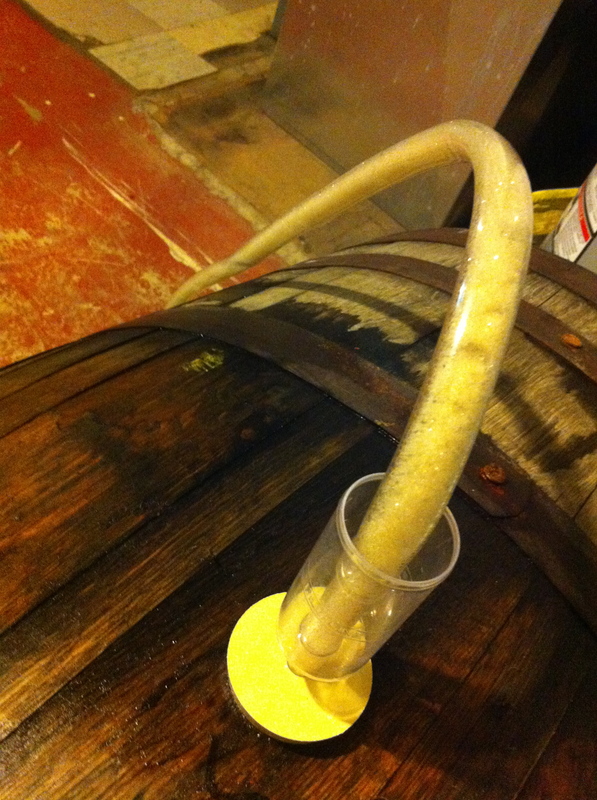 The set up was simple – the airlock was removed from the bung and replaced with a racking cane. A small hole was also drilled in the bung to allow for tubing from the CO2 tank. 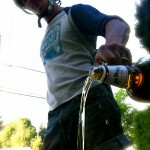 A few pounds of pressure were applied and out rushed the dark, clear beer. 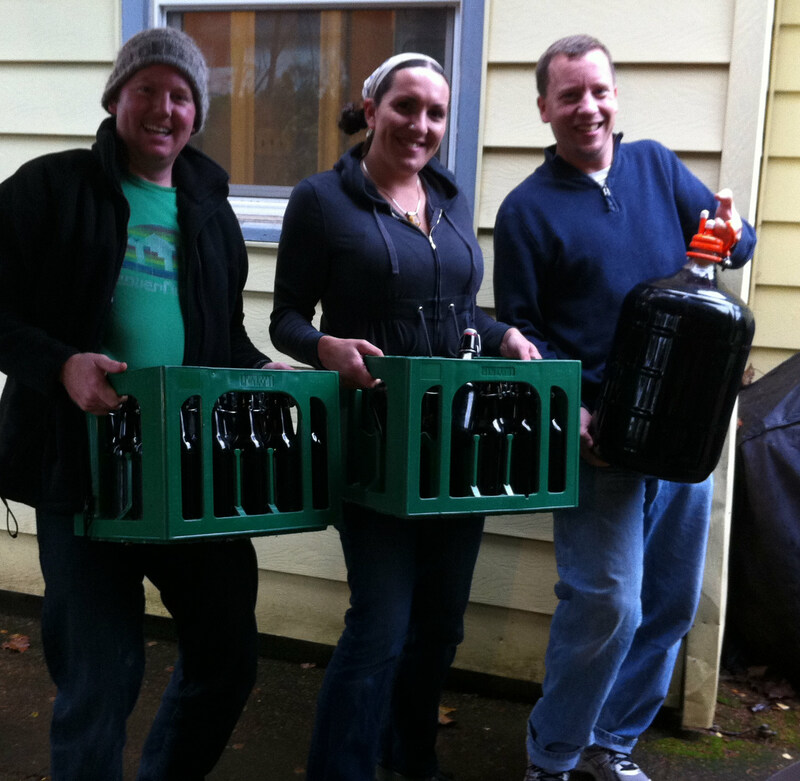 Each share was measured carefully and then placed into carboys, kegs, or directly into bottles. 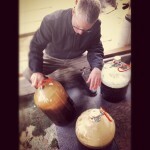 In the end, we pulled a full 53 gallons from the barrel – though there was some yeast in the last 1/2 gallon. A final gravity reading surprised us: 1.010 was well below the expected 1.021 … This means that the brew is actually 11.4% ABV and I’m OK with that! A big thanks to everyone that came out to help – and all of you that made this possible. Cheers! 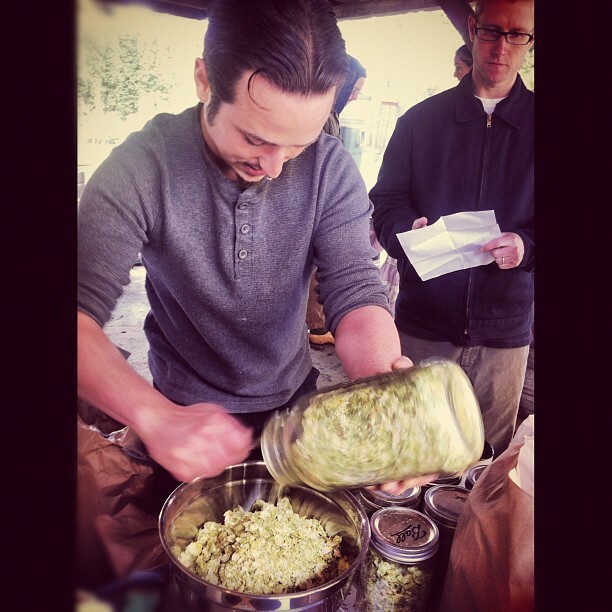 Sooooooo – Saison session next? ’tis the season. Let’s roll it out – we have a crew and the equipment. I’m in for 10 gallons. Thanks for the inspiration Gabe, Sam, Ro, Jamie, and all. Right on. I saved a sample for you… plus 2 cases of CDA!